From the 10th anniversary edition of The Vegan (winter 1954 volume 9 number 3 pages 9-12). Available as PDF. Learn more about Leslie Cross and the history of veganism. This is an attempt to state in simple terms what veganism is and why and how it came into existence, and to suggest what it could mean for mankind. The word "veganism" is a symbol that stands for a major change, a new mutation comparable to the freeing of the serfs and the freeing of the slaves. Its official definition — "the doctrine that man should live without exploiting animals" — is accurate, precise and comprehensive, but not always fully understood. This is not as surprising as it might seem, for rarely have nine short words enshrined a reform so massive, the achievement of which would bring a new world and new men to inhabit it. Why do we believe we should live without exploiting animals? To put the question in another form, why was such a doctrine formulated? The final if not the immediate answer is a revealing one, for it demonstrates the truth of the claim that veganism is not a mere side-shoot in human evolution, but a central extending growth of considerable significance. Veganism owes its birth to the fact that at the deepest point within us we believe impregnably in freedom—particularly perhaps those who were born and bred in these traditionally freedom-loving islands. Freedom to live our own lives in our way, according to our own inward light, is fundamental to our view of life itself. It is in the light of this concept that we find the true significance of the vegan reform. Only when we see it as a doctrine not of restriction (as those who oppose it mistakenly believe), but of freedom, do we fully comprehend it. The simple fact is this: that at rock bottom, veganism is the most recent of the periodic surges which have marked the tide of freedom ever since history began. It is distinguished from its predecessors by virtue of the fact that it brings a quite new and distinctive feature into the long fight for liberty; it has driven the tide of freedom beyond what has hitherto been held to be its natural boundary — the concept of the free man. Until the advent of veganism, comparatively few men regarded the animals as being either worthy of or entitled to the right to be free, and probably fewer still realised the impressive effect which the granting of such a right would have upon the freedom of man himself. The real, the indelible significance of veganism is its devastatingly logical demonstration that by denying to the animals the right to be free, man keeps locked against himself the gateway to his own further pursuit of happiness. To believe in the right to be free means inevitably that we grant that same right to others. If we fail in this, we deny the principle itself. We thus make of Orwell's 1984 a logical possibility and the slavery of one man to another a justifiable act. To put it in another way, the law of freedom — which is also the law of love — knows no limits. Because in his mind man has excluded the animals from its operation, he has set arbitrary limits upon it, and in so doing has reaped what he has sown — a severe limitation upon his own progress. It is upon this factor, this little recognised bar to the upward growth of man, that veganism throws such a ruthless and revealing light. When we turn to the question of how veganism came into the world we find an excellent example of the indirect approach which the forces of destiny sometimes adopt. The mundane fact is that the seed of veganism grew out of a year's argument in the correspondence columns of The Vegetarian Messenger about the moral case against the use of dairy produce by vegetarians. At the end of the correspondence, a handful of vegetarians decided they would like to form themselves into a "non-dairy" group within the Vegetarian Society. But the Society declined and suggested that these few members should set up an organisation of their own. Thus was the Vegetarian Society the unwitting handmaid of destiny, for the direct result of its action was the formation of the Vegan Society in November, 1944. The new society was not long content with being merely "non-flesh, non-dairy, non-egg, non-honey". Commodities such as fur, leather and wool joined animal food as being "non-vegan". There was an early attempt to get at the root of what is wrong with the relationship between man and the animals; to deal with the cause rather than its almost uncountable effects. However, not without some years of internal stress and strain was the society able to be precise about what it wanted to do. It made up its mind finally on November 11th, 1950, when it agreed in a special general meeting that what it wanted to do was end the exploitation of animals by man. Between 1944 and 1950 the inner and true meaning of veganism was held "in solution", undefined and incompletely recognised. The "non-dairy" motivation was from the start clearly insufficient as a final meaning; it was in fact no more than the trigger-movement that impelled a new and profound truth into the world. 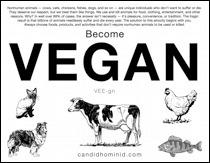 In 1950, when the meaning of veganism became generally apparent, it was formulated into a simple phrase which was inserted into the society's constitution. Since 1950 there has been no doubt as to its meaning. The short definition quoted in the early part of the article is amplified by Rule 4 (a): "the Society shall seek to end the use of animals by man for food, commodities, work, hunting, vivisection and all other uses involving exploitation of animal life by man." Although prior to 1950 there was a good deal of argument as to what veganism in fact was, one thing was never in doubt: the impelling power behind the movement was, and remains, compassion for the animals, arising out of their treatment at the hands of man. It was compassion that led the first handful to band together in 1944 and it is compassion that provides the motive power to-day. As a society, an important part of our work is to bring to the notice of men everywhere something which might otherwise escape their attention: the all-round importance of animal emancipation. Animals present man with the supreme test of his worthiness and ability to advance; the test of how he behaves toward those over whom he possesses power. It is sad but true that in the face of this test more often than not he seeks his own ends at the cost of suffering to the animals. He hunts, slaughters, vivisects and enslaves them. To obtain their milk he inflicts upon them some of the least worthy of all his exploitations — the deliberate and forcible separation of mother cow from baby calf. He takes the wild, free and noble horse, breaks, castrates and harnesses it. His constant prayer is not so much for daily bread, as for daily flesh. The compassionate man may well be excused for asking pointedly what kind of a relationship this can be, that has for its symbols the whip and the bit and the slaughterer's knife. The American writer Henry Bailie Stevens has argued that one of the "wrong turnings" taken by man somewhere in his evolution was the enslavement ("domestication") of animals. The contention is to say the least logical. There is not much common sense, for example, in asking for peace on earth and at the same time prosecuting what amounts to war upon the animals. What is needed to begin with to correct this evolutionary deviation is acceptance of the idea that animal emancipation is a desirable aim. If a sufficient number of people experienced such a mental conversion, then the skills and ingenuity of men could be used to develop alternatives to those products of animal origin which the majority of men undoubtedly believe to be essential to their well-being. These products — a completely satisfactory non-animal milk is an example — are necessary if the universal practical application of the ideal is to be achieved. For men and women are not all alike and there are many for whom the practical obstacles must at present seem insurmountable. We cannot shut our eyes to the undoubted fact that to such people such obstacles are real and not imaginary. In order to provide the vegan movement with sufficient resources and skill, it is vital to attract people to it. The most immediate method is the spreading of the idea — the idea of animal emancipation. We shall welcome converts of whatever degree — those who can promise no more than mental acceptance equally with those who faithfully and so far as they are able, put their acceptance of the ideal into daily practice. As the idea becomes more and more accepted, opportunities will grow to make the path easier and more attractive for those whose nature is not that of the pioneer. Concurrent with the gradual removal of obstacles to the personal practice, attention will have to be given to the question of how we propose to deal with animals in general as soon as the change-over from exploitation to freedom reaches a certain stage. It is not difficult to see that such a change-over will bring with it problems of a wide and general character. No-one, least of all the vegan, wants a world without animals — and how in general and in detail we propose to effect the swing-over from exploitation and perversion to freedom and naturalness will be quite a talking point one fine day. If I may intrude a personal observation, there is little more desirable I would ask of providence than that such a day should dawn while I am still here to experience it. How glorious, for example, to take part in a discussion to decide whether, for the purposes of the change-over, a nature park or an animal sanctuary should be set up in this or that part of the country and exactly how it should be planned! But some of the changes are not so obvious. The benefits to man himself of living in a kindlier and more enlightened world can be envisaged only in broadest outline. His health, physical and mental, will be vastly improved. Because he will have shed a great deal of the coarser part of his nature, benefits of the spirit will shower upon him — benefits which to-day by his own short-sighted volition he denies himself. Such is the stuff of dreams... To make them true requires that we play our part as it comes to us. We are in the very elementary states of the new mutation. We are the pioneers.